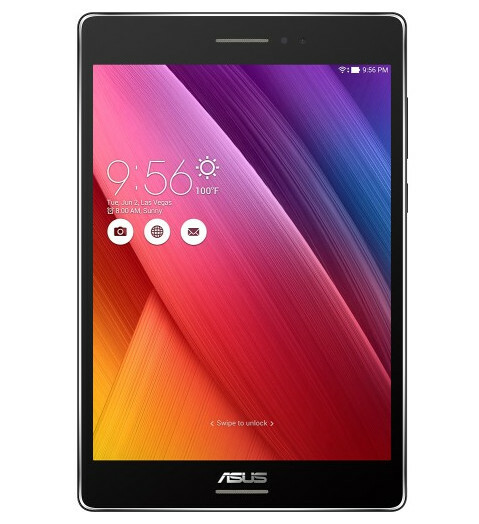 Asus has just released a new upper mid-range 8-inch tablet called the Asus ZenPad S 8. It has a good specs to dollars ratio, as well a really high resolution screen great for all forms of ereading. The ZenPad 8 has a similar screen as the Retina iPad Mini. It’s a 4:3 ratio 8-inch screen with a resolution of 2048 x 1536, which equates to 320 pixels per inch. The tablet also comes with an impressive amount of storage space, with 32GB onboard, and there’s a microSD card slot that supports cards up to 128GB. Best Buy seems to have gotten an advanced shipment of the Asus ZenPad 8, as they are the only place that currently has any in stock, while other websites list it as coming soon with an expected arrival date in August. The listed retail price is $199, which isn’t bad but it’s not great considering you could get the 10″ Lenovo Tab 2 A10 for $199, which also has a nice screen and upper mid-level specs but with lower 224 ppi. Once the ZenPad 8 goes on sale it will be pretty hard to pass up. There have been very few options for an 8-inch tablet under $200 with a respectable high resolution screen. Almost all have 1280 x 800 or lower resolution screens. 2048 x 1536 is a huge difference when it comes to text clarity and overall screen quality. Some of the specs differ from Best Buy’s website and what’s on Asus’s website for the ZenPad 8. For example, the cameras are listed as 5 and 8 MP on Asus’s website, and 2 and 5 MP at Best Buy. Battery life is another discrepancy (8 hours vs 9 hours). I think that a 8″ device shouldn’t be compared to a 10″ one even in the same price range because the usage is different. The 8″ one is more portable, being lighter and in a size factor which makes it easier to hold in one hand. I was looking for a tablet eReader and this Asus seems a better choice than the Lenovo S8 at $169 because of the battery life. Yeah but on the other side of the coin some would see a tablet with a larger screen and similar overall specs for the same price as an upgrade. If I had to choose one or the other I’d definitely go with a 10″ tablet. In fact I did. I ordered a Lenovo Tab 2 10 while it’s on sale for $179 and it’ll arrive next week. But if I saw this tablet for $179 or less it would have been really hard to pass up. Portability isn’t an important factor to me though, so I’ve always liked bigger tablets better for web browsing, reading PDFs, comic books, etc. It depends on the intended use. A ten inch tablet is great for looking at web pages, not so good for reading ebooks. The reverse applies for smaller tablets in the 7-8 inch range. That 10 inch Lenovo weighs nearly twice as much as the Asus. I predict you won’t spend hours with it doing one-handed novel reading. There is a Z580C and a Z580CA. Best Buy has the first. The second is $299 in USA . Both share. “ASUS ZenPad 8.0” name . I suspect the ‘S’ is the separator of. CA from plain C .
Bought one last week and returned it after about 4 days. The screen is great along with Lollipop Android and the device is very light weight and thin. But the device can be sluggish at times probably because it comes with the Asus power management set to battery saver mode since it has a rather small battery. And, even with the power saver feature on (limits screen brightness and CPU speed) I was struggling to get 6 hrs with web surfing and the occasional YouTube video (no movies or games). Thanks for the report. That’s disappointing to hear about the performance and battery life. Powering all those extra pixels sounds like it comes at a price.